Life in the Schmidt House: Are you truly Outrageous? So I was a die hard Jem fan. It got so out of control at one point that I would write my name with the n's so close together that it looked like "Jem" hoping people would call me that on accident. Looking back, she probably wasn't the best role model for me--as you can tell from the video-her relationship with purple-haired boyfriend Rio, was not only extremely physical (hello--they're always kissing) but was also full of it's ups and downs (ahh, the life of a rock star). Not to mention that she's always ditching her friends (poor Kimber and Stormer) for her man--lame. However, some good did come of Jem and the Holograms. For one, that earring she wears is pretty darn cool. I think I specifically remember touching my ear more than once and saying something to the effect of "Go Cinergy, it's time." Also, if nothing else the phrase "truly outrageous" is quite fun to say. Try and work it into your next conversation and I'm sure some underground Jem fans will reveal themselves. (A Gold star to anyone who can tell me how many times the word "truly" is said in the "truly outrageous" song). 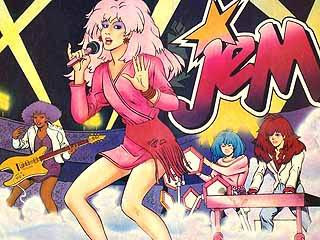 Nevertheless, Jem is a fond memory from my childhood. I got the Jem barbie at one point and only liked her until her earrings burnt out. She had what I used to think of as "man feet"--you see Barbie had feet for high heels, Jem could only wear flats...ugh! This old obsession has recently resurfaced as I got a pair of earrings from a garage sale that are purple stars...I must say when I wear them (even if I'm grocery shopping) I do indeed feel truly outrageous. I'm suspicious that the Jem obsession and the purple hair are somehow related! It's actually synergy not Cinergy. One is a power for Jem the other is power for Cincinnati.